Cottage Knotty original avec seulement 12 marches sur le sable! Sur l'océan dans le quartier calme de Roads End. Grande terrasse avec un bain à remous surplombant la plage. À quelques pas des piscines à marée ou du casino Chinook Winds. Salle familiale avec foyer au gaz et grandes baies vitrées donnant sur le sable et les vagues. Douche extérieure après la baignade dans l’océan, les pieds sableux ou le bain à remous. 3 chambres (1 lit king, 1 lit queen, 1 lit double) et 2 salles de bain. WIFI disponible! Lumière de surf. Téléviseurs à écran plat. Parking couvert. Notre livre d'or le dit bien: "Nous nous sommes particulièrement amusés à regarder des personnes de toutes formes et de toutes tailles promener leurs chiens de toutes formes et de toutes tailles." «Un Norman Rockwell Place». * Max 6 invités, visiteurs compris - 2 véhicules *. SEA STAR NORTH & SEA STAR SUD JOUENT DES COTTAGES À LOGEMENT SÉPARÉ. CHAQUE SOMMEIL 6 PERSONNES. Été 2019 juillet et août, 5 nuits minimum (à moins de combler les lacunes). S'il vous plaît éviter de quitter "Single Night Gap" juin-septembre et vacances de printemps. La fête du Travail et le week-end du Memorial Day sont au minimum de 3 nuits. Another wonderful Beach vacation spent at the Sea Star in Lincoln City. Cozy, comfy little cottage perfect for our family gathering. The location is ideal, just twelve steps to the beach. All the amenities one could ask for. We love both Sea Star South and Sea Star North. We come back every year and will continue to do so ... Our Happy Place! We had a great time! The location is perfect and the house is very dated, but functional. My only real concern is that much of the house has not been cleaned in a while (window sills, corners, etc.) as there was a lot of dust built up in some areas. It could use some updating, but like I said, we had a great stay and made things work! 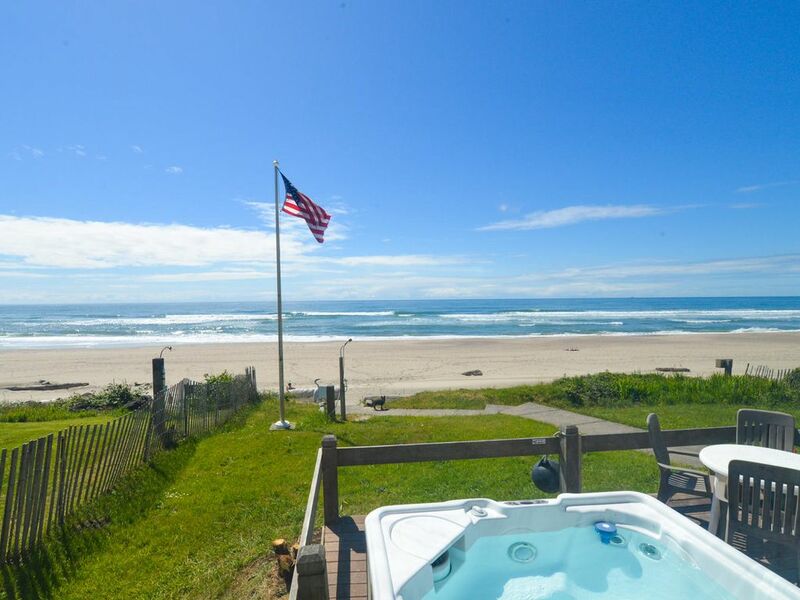 I have been a customer of A1 Beach Rentals for years.They are a great company to find your perfect beach rental on the Oregon Coast. I have never had any problems with the houses I have rented. They are clean and well supplied. Friendly and helpful staff I would highly recommend A1 for your perfect Beach get away!!!!!! Thanks for staying! Come again soon! I could have stayed here a month. The home had an amazing view of the ocean with stairs down to the beach. The dining room/living room had hugh windows and faced the beach so you could stay indoors if it rained and still enjoy the view. The bedrooms were spacious, the beds were comfortable, there were plenty of towels, and the kitchen had plenty of counter space and dishes. So pleased you had a good stay! Come again soon! Nice,except for dish washer is a pain.lots of fun to be there. Thanks so much for staying at Sea Star! Hope to see you again soon! Wonderful as always, beautiful weather everyday! Thanks for staying! Come visit again soon!